Sausages, to be properly juicy and tasty should really have a high meat content and they are usually high in saturated fat as well. I steer clear of those. 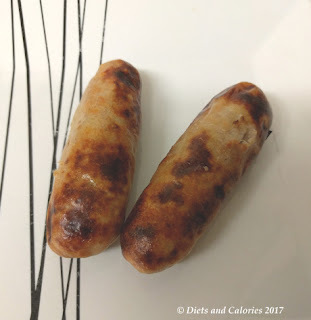 Fortunately there are some much lower calorie sausages and these Outdoor Bred Skinny Sausages from Marks and Spencer have only 78 calories each and are gluten free. About once a month I make a 'healthier' style cooked English breakfast for dinner. Who has time in the morning? The meal consists of bacon, eggs, sausages, tomato, mushrooms and baked beans. 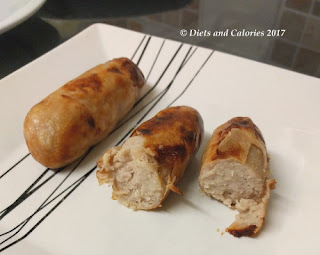 I do my best to make sure each ingredient is as low in salt, fat and calories as much possible, but when it comes to sausages this can be a little more challenging. 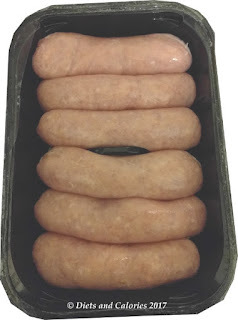 These M&S Eat Well sausages may be called skinny, but don't be misled. They're skinny in calories only, but chunky in size. I decided to grill them and the recommended grill time is 20 minutes, or 15 minutes in a frying pan. As my grill has only one setting, high, these sausages started to burn quite quickly on the outside. I had to turn them more frequently to ensure all sides were evenly done and I didn’t use any extra fat to cook them. They sliced very well and remained firm after cooking. As they are less than 3% fat, there was virtually no fat leaking out during cooking. I didn’t find them dry as I expected, and thought they were very meaty with a pleasant spicy herb flavour. The rest of the family happily devoured them, but whether or not that was because they were drowned in ketchup I don’t know! 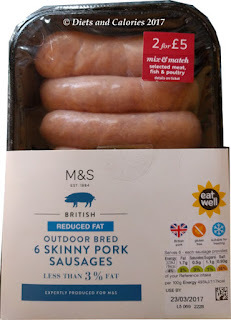 You can find Marks and Spencer 6 Skinny Sausages in branches of M&S Food halls. Suitable for freezing; Gluten Free; British Pork. Ingredients: British Outdoor Bred Pork (70%), Water, Gluten Free Crumb (rice flour, chickpea flour, cornflour, salt, dextrose), pasteurized free range egg white, potato starch, salt, dextrose, stabilizer E450, Guar gum, yeast extract, antioxidant: E301, preservative: E223 (sulphites), flavouring, dried onion, spice extracts (black pepper, mace, ginger, coriander, cinnamon), sausages filled into natural pork casings. Nutrition information per sausage: 78 calories, 1.7g fat, 0.5g saturated fat, 1.1g sugars. 0.18g salt. Nutrition information per 100g: 117 calories, 2.5g fat, 0.8g saturated fat, 6.4g carbohydrates, 1.6g sugars., 1.2g fibre, 16.6g protein, 1.38g salt. I saw a production in M+S once that said something like "carbs: 8 of which sugar: 12" so I wouldn't put it past them to do something like this in future. They're nice but i dont like the outer casing. its very chewy. maybe use a more natural casing M&S?